As I reported in What You Should Know if You Have an ESL Child, research shows that bilingualism has positive effects on children’s cognitive development1. And we also know that young children are at risk of losing their home language. 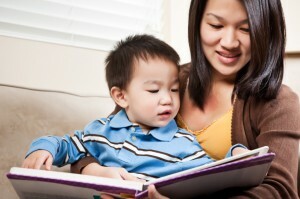 So how can parents support their child’s bilingual language development at home? Focus on the positive, on what your child can do. Do not overcorrect grammar. Be patient! Learning a new language takes a lot of time. Avoid comparing your child to a monolingual peer. Encourage your child to join school clubs and have play dates. These provide opportunities to develop their social English. READ! I cannot stress how very important reading is to develop any language. Books contain more complex grammar structures than the ones we use in our day-to-day conversations. Children who are learning English gain exposure to more academic language through reading. If your child cannot read yet, read picture books to them. Discuss new and interesting vocabulary words from these stories. It is essential to try to expand your child’s mother tongue. Children will transfer the skills and concepts they’ve learned in their first language to English. READ in the mother tongue. For young children, reading to them in their mother tongue exposes them to new vocabulary and provides opportunities to discuss concepts. For older children who can already read in their first language, ensure they have access to a variety of books in that language. Encourage a positive attitude toward being bilingual/multilingual. Use the mother tongue outside the home, in a different environment. This could include visits to festivals, libraries, churches, the beach, sporting events, etc. where that language is spoken. Enrol your child in a language class, if one is available in your mother tongue. Keep a variety of mother tongue resources at home: nursery rhymes, songs, videos, DVDs, TV programs, fiction and non-fiction books, comics, cookbooks, games, etc. Consider doing fun family projects that use language, such as creating a scrapbook of photos, a Powerpoint of a recent holiday, an audio-recording of a favourite childhood story, video recording of your child or you singing a favourite song…be creative! What is your child learning about at school? Find out! Talk about what your child is learning about at school, in your mother tongue. After all, this is the language that all of your child’s background knowledge and experience is in. Translating new English words to your mother tongue is a start. Helping your child understand bigger ideas and concepts is even more important—for example, explaining the idea of fairness. Once the child understands a concept, it’s just a matter of learning the English ‘label’ for it. Provide reference materials in your mother tongue to support whatever your child is learning about at school. This could be from the internet or from books purchased or borrowed in your mother tongue. Most importantly, language learning should be enjoyable! Language that is used for real purposes in a social context is meaningful and motivating for children. If children are drilled or criticised about correctness, or see learning a language as a chore, the experience will be a negative one (for either language). If you are interested in reading more about raising bilingual or multilingual children, here is a short list of books to get you started. Where possible, I’ve provided links to sites where the books can be purchased. A Parents’ and Teachers’ Guide to Bilingualism, by Colin Baker – This book is fantastic because it’s written in question and answer format. This means it doesn’t have to be read cover-to-cover. Parents can just look for the question they have and it is answered in detail!